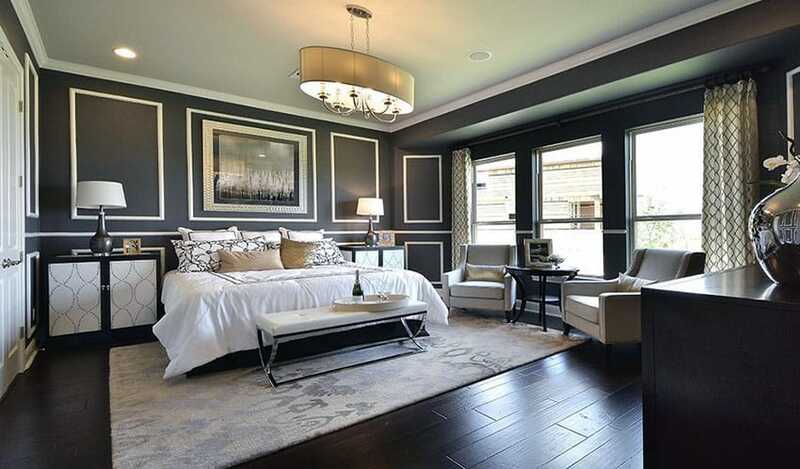 Welcome to our gallery of jaw dropping black bedrooms in an assortment of design styles. There is something really sophisticated and stylish about using black decor, and furnishings in a bedroom design. Black bedrooms allow you to make a bold statement and bring out your personality to your interior design. Below are pictures of how black can be used to create alluring bedroom designs for ideas and inspiration. Be inspired in the image above by this elegant black bedroom which feature patterned wall paper, carved wooden furniture in deep dark black lacquer finish paired with white upholstery, white walls and ceiling with exposed beams in dark tone finish, vintage chandelier, glass base lamp shade and mirror finish night table. The solid hard wood flooring in light natural finish gives this bedroom a warm and cozy contrast complemented by a shaggy silver gray color area rug. This chic bedroom features a black ceiling and accent wall with cream border which extends to the baseboard and cornice. An elegant tufted headboard and a vintage chandelier gives this black bedroom a stylish focal point. Paired by silver candle holders and cream picture frame accessories, classic lamp shades, mirror finish night stand and dark tone hard wood floor ties up the whole design scheme. 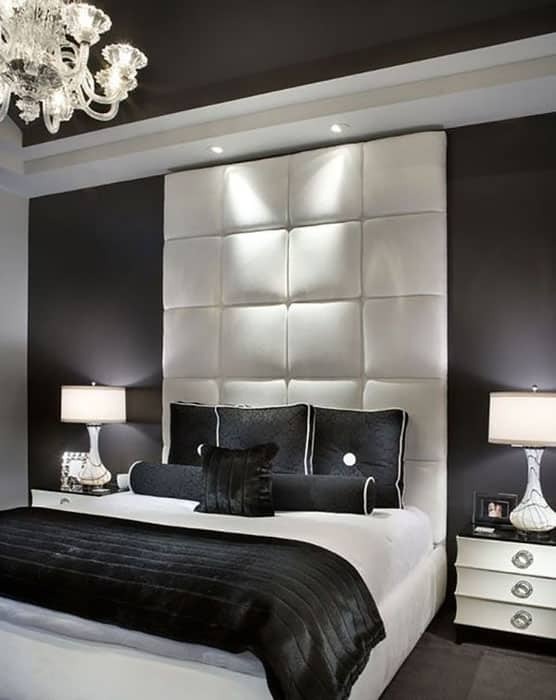 A master bedroom features gray and rich dark black walls paired with white modern furniture with crystal chandelier, silver and glass accessories. 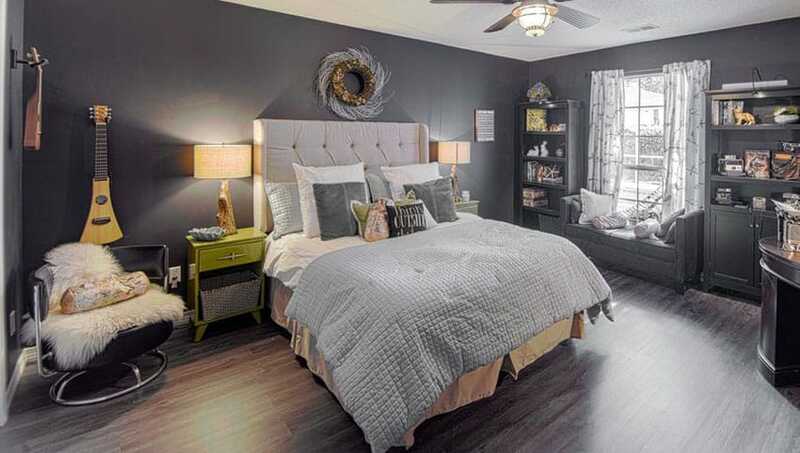 A medium tone finish laminated wood flooring gives this black bedroom a warm and cozy feel. This elegantly serious black master’s bedroom adorned with crystal chandelier and bejewelled wall accent and mirrors create a masculine and modish design scheme. Patterned silver headboard with dark tone wood frame, custom design night table and dark tone flooring carry on the luxurious design style. White shaggy area rug balances the overall texture and feel of the room. An oversized custom design tufted headboard with solid wood frame in dark tone finish is the main design feature of this stunning black bedroom design. Accent black wall with rows of wall lights makes you feel like you are the star of this bedroom setting. High windows and modern furniture design fits well with the design scheme. This contemporary master bedroom features a white tray ceiling, textured dark finish accent wall and large picture windows which brings the outdoor landscape into the room. Mix and match furniture with different materials, texture and finishes create a cozy and warm feel for this bedroom. A perfect place to relax and unwind after a long day. The black textured wall let these intricately carved silver gilded headboard and night table stand out in this luxurious bedroom. Velvet and organza fabrics with different patterns balance the whole design feel of the room. The black accent wall is contrasted beautifully by the light wood flooring in the room. 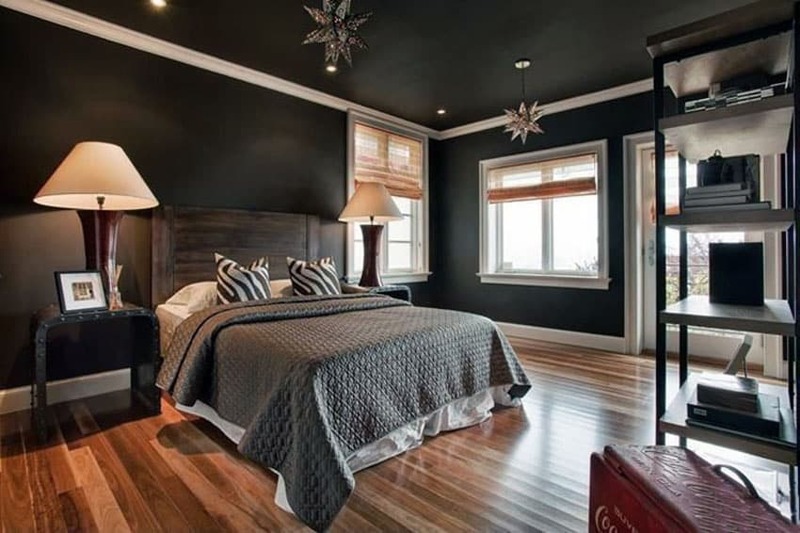 Bring that elegant black to the bedroom by using dark tone hardwood flooring and black furniture. White trim on the walls, baseboard and molding, as well as white fabrics and area rug, chrome finish furniture and accessories provide a classy chic design. The large window panels allows ample natural light to come in and brighten this master bedroom and gives a feeling of openness. A modern master bedroom features a padded black accent wall provides the main focal point. Both black and white furniture balances the color scheme. The medium tone wood flooring works well with the design and to bring in a warm deviation to the design scheme. Black accent wall creates a perfect backdrop for the hanging LED strip lights. Mural painting on the wall, different fabric patterns and materials provide a chic distinction to the design concept. An interesting design feature of this black and white bedroom is the full size black chalkboard wall, combined with a whiteboard wall. Allow your personality and creativity to run wild by canvassing your room in whatever mood you’re in for the day. By using a paint that dries into a chalkboard finish, this accent wall idea allows endless creative display of design layout for this awesome black and white inspired bedroom. Recycled crate boxes are perfect versatile and practical accessories to fit any purpose. Simple geometric fabric patterns and modern Edison style pendant lights provide fine accents. Light curtain material gives an openness and airy feel to the room. Black is a strong color and as radical as it can be, this decorating idea has created this small guest room in the attic more sophisticated than ever. Black ceiling can look this amazing on your ceiling and will make any room higher and wider. White wood wall panel paired with dark tone wooden flooring provides a warm welcoming feel. A four-poster bed fits perfectly in this beautiful black bedroom. 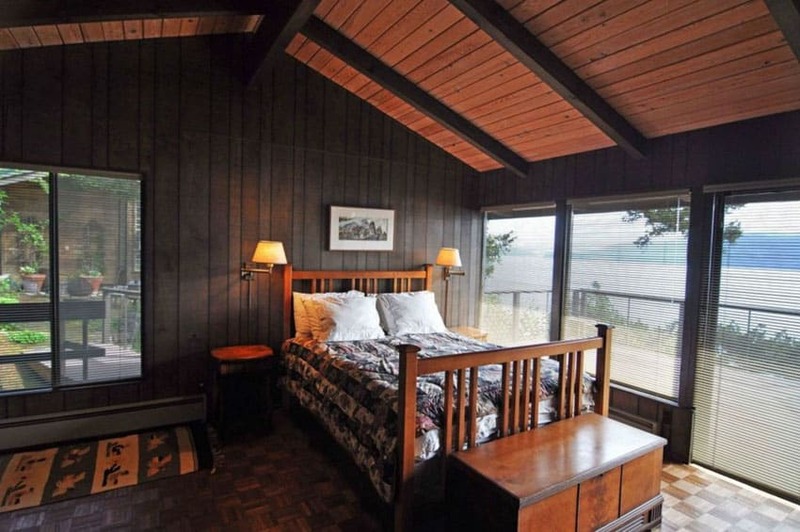 This traditional black painted master bedroom has the finest lake view. Reclaimed dark tone wood panel stiles combined with a lighter tone wood panel rails ceiling with exposed beams gives this bedroom a rustic design scheme. Balanced with parquet flooring in dark tone finish, paired with solid hardwood furniture in medium tone finish adds a warm and welcoming feel. This traditional master bedroom is painted in an almost black, midnight blue making it a great backdrop for the white furniture and accessories to standout. White trimmings for the baseboard and moldings perfectly ties the color scheme of this bedroom. Light ceiling and dark tone flooring balances the color palette. By adding a crystal chandelier, this master bedroom is given an elegant touch. Black accent wall which extends to the drop ceiling over the queen size bed works perfect with the white walls and ceiling; making this apartment bedroom a cozy place to combine the master bed and nursery. Large panel windows allow enough light to brighten up this room. Silver accessories such as the lamps and the artwork feature a well-balance contrast for the design scheme. Black bedrooms when paired with white can be an attractive choice especially when the room receives a lot of natural light from windows. This elegant master suite features white eclectic furniture, leather tufted headboard and upholstery, black and white stripped walls, black floors and glass teardrop decorative elements. By incorporating different textures for the wall, furniture and accessories; this bedroom now has a stylish and luxurious ambience without having to compromise the designer’s choice of colors. Textured accent walls gives this bedroom its own unique signature. 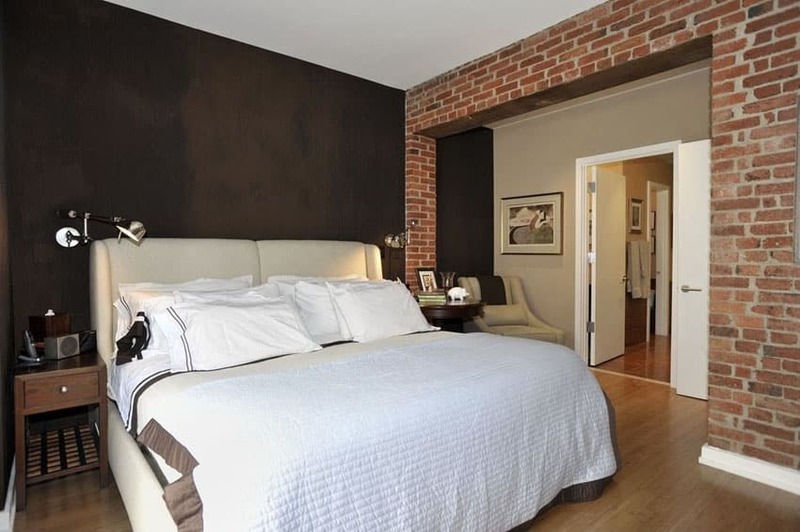 The brick wall blends perfectly when paired with the black and beige walls, light tone finish for the floors, mix and match furniture and accessories. A strikingly warm and welcoming ambience allows any guest to feel at home. Patterns can make or break a design scheme. 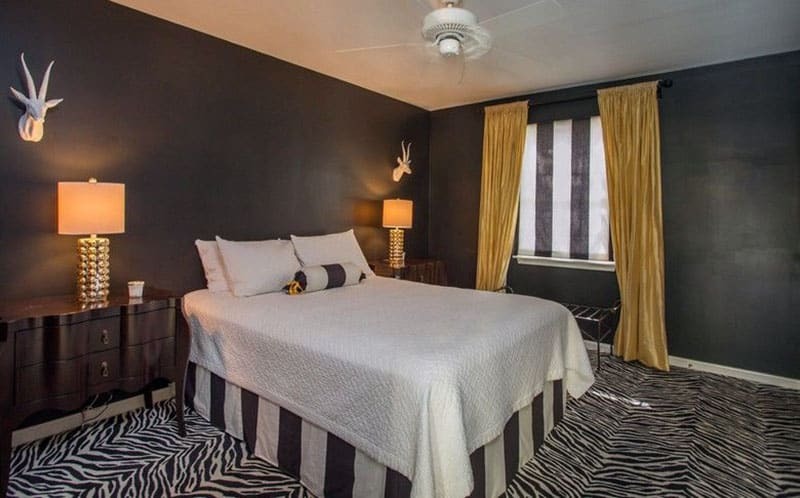 This African inspired bedroom incorporates two distinct pattern – stripes and animal skin pattern in black and white combination. Black walls and white ceiling emphasized by the gold accent color of the curtains, decorative wall ornaments and light fixtures suggests a Safari design theme. These black walls provide a perfect backdrop for the breath-taking scenery outside and for the decorative artwork and framed photographs. White ceiling, trims and molding compensates the dark tone hardwood floor. More presence of nature is seen through incorporating plants as accessories, on textile design patterns and choosing green as accent color. This luxurious contemporary bedroom features a black accent wall, providing an ideal background for the high upholstered headboard which extends up to the ceiling beam. Glass-based lamps, accessories and crystal chandelier add charm and elegance to this bedroom. Black velvet and satin fabrics suggest such refined taste. Medium tone gray walls and high glass sliding window allow the beauty of nature to be the wrap-around backdrop view for this master bedroom. Simple furniture design, minimal use of accessories and light neutral tone flooring keep the eyes focused on the view outside. This contemporary black master bedroom incorporates medium tone hardwood floors with black walls and ceiling yet still creates a relaxing ambience. Reclaimed wood are used for the headboard, simple furniture and accessories adding a cozy and feel at home country touch. 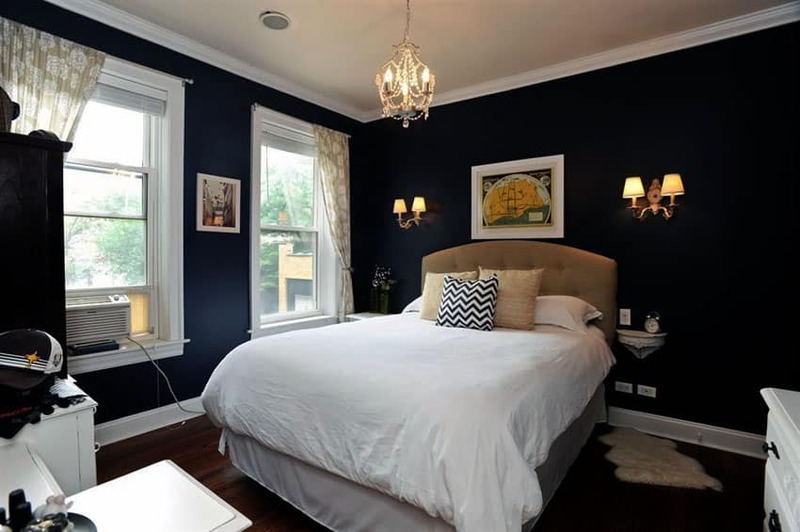 Black bedrooms can be romantic and seductive. This modern theme master bedroom in black and white color scheme highlights a textured dark gray accent wall and a black leather bed frame with tufted headboard paired with a black leather tufted ottoman. Modern pieces of lighting fixture in chrome finish, night table and a simple writing desk in dark tone finish balances the whole modern design theme. White tile flooring, shaggy carpet in neutral gray color and white patterned fabrics give a soft and light overall feel. 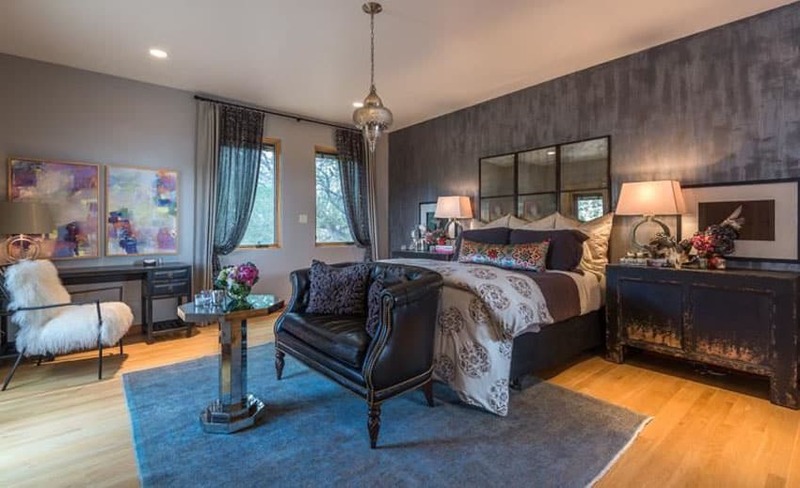 Express yourself in this eclectic bedroom featuring a dark textured accent wall, light tone wood floor, framed mirror headboard, mirror finish and rustic wooden furniture pieces, different texture upholstery, floral prints, eye-catching artwork and accessories. A mix and match of everything and yet makes you feel comfortable, cozy and relaxed. This masculine black master bedroom is designed with such refined taste. Neutral tone color stone flooring, black silver gilded furniture, black and chrome accessories features an exquisite design choice. Dark army green accent color blends perfectly with the textured dark gray walls and ceiling. Lavender silk throw pillows provide an accent color yet retains the robust design theme. This master bedroom is decorated with a color palette of grays beginning with the leaf patterned accent wall combined by a lighter tone of colors for the ceiling and floor. Dark tone wooden night tables and headboard with simple clean lines blends perfectly with the design scheme. Color choices for the textiles and fabrics are selected from the wall pattern incorporating different textures, giving this bedroom a warm cozy feel. 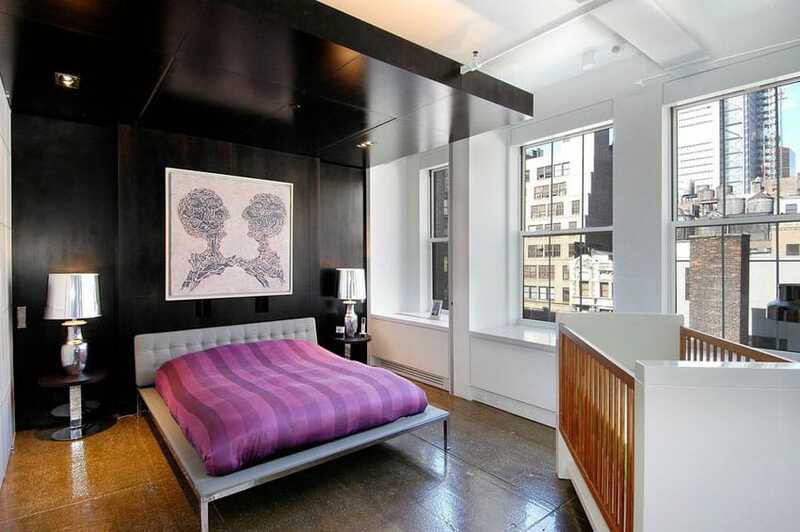 Black bedrooms often aim to offset the dark theme by bringing in pops of color and decor. This eclectic inspired design theme features exquisite choices of furniture and accessories. Black walls paired with white ceiling and medium tone wood flooring conforms with the whole design scheme. Bright green night stands and white bed frame and curtains bring a little lighter shades to the space. A fusion of textures distinctively designed and combined with such elegance, makes this bedroom a relaxing and cozy sanctuary.